A business travel warrior is someone who travels often for work. 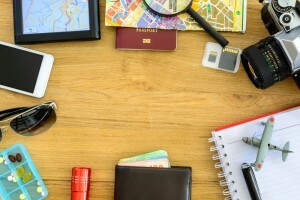 If you are a travel warrior, choosing the best accessories is essential. Your decision will make the trip easier and more efficient. With millions of travel warriors, the number of accessories and gadgets developed over the past few years has skyrocketed. Although some are worthless, most add incredible value. According to experts, the average trip taken by a travel warrior covers 268 miles, almost triple if traveling by air, with most people staying in a hotel a minimum of two nights. That is a lot of time away from home, so it is important to choose accessories that help with both business and personal needs. Here are four of the best accessories that will benefit you as a travel warrior. Card/Phone Holder with Wrist Strap – Two things that you need quick and easy access to on a frequent basis are a credit card and phone. Instead of digging through your wallet or purse, which often requires setting down luggage and other items, you can purchase a convenient case holder with wrist strap. This unique accessory is also the perfect solution for holding confirmation numbers, phone number and contact name for your limo company, boarding pass, driver’s license, and cash. The accessory straps securely onto the wrist, providing you with a hands-free solution for getting to important items. Portable Charger – You will never go wrong in purchasing a portable charger for all your gadgets. To avoid long lines at airport charging stations, you can use your pre-charged device to charge all your travel gadgets and phone virtually anywhere. Luggage Bag Bungee – If you travel with a small bag and/or laptop, a luggage bag bungee is extremely helpful. This specially made travel accessory keeps all your belongings together and has a competitive price. Bottle Hook Holder – If you travel on business often, you probably have a bottle of water in tow. Unfortunately, with luggage, a laptop, and other belongings, the bottle becomes an annoyance. To avoid throwing out a perfectly good bottle, you can purchase a bottle hook holder that attaches to your belt loop, purse strap, or luggage. A professional chauffeur also can make your business trip easier by picking you up at the airport, helping with any luggage, and then delivering you to meetings or the hotel in a comfortable and safe fashion.